If you eat, if you breathe, if you value food or water or air or soil, if you have an interest in anything remotely related to plants or animals or people or communities or the environment, if you love tomatoes, hate tomatoes or if you’re on the fence about tomatoes, you should consider the UC Davis College of Agricultural and Environmental Sciences. The rest of you should probably check us out, too. We’re the No. 1 college of agriculture in the country and a really cool college. Just watch the video with the post below. We’re also the oldest college on campus because, for many decades, we were the only college on campus when UC Davis opened its doors as the University Farm in 1908. In 1959, our college became part of a full-service university that offers many classes beyond tractor driving (though you can still take that class during spring quarter — enroll early, it’s popular ). In the 1960s and ’70s, when it began to dawn on society that perhaps the Great Lakes shouldn’t catch on fire, we added environmental sciences to our curriculum. You can study the air, as an atmospheric science major. You can study nature, as a wildlife, fish and conservation biology major. You can study water, as a hydrology major. You can even study the land, minoring in soil science — as long as you promise not to call it dirt. We also recognized that our research has a significant impact on the bigger picture in California — on labor, on food systems, on communities. And we bit into that, too. So if you want to major in human development or community development, that’s the College of Environmental Sciences. If you’re interested in nutrition, that’s us too. Business? Yep. It’s called “managerial economics,” but our graduates wear nice clothing to work as employees for places like Deloitte or LinkedIn. Trust me, it’s business. I imagine you’ve heard that the academics in our college are rigorous. If you’ve met our challenging criteria for admission, then you’re no stranger to hard work. 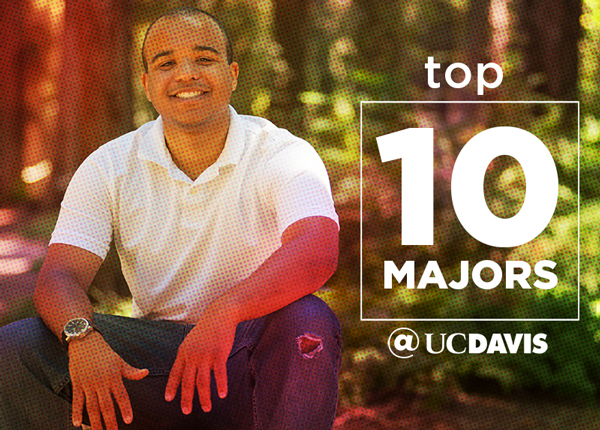 But once you’ve made it to UC Davis, people want you to succeed. There are oodles of places where you can seek academic support, tutoring, counseling and relaxation. We even have hammocks on the Quad for taking a nap in the shade. Anyway, coursework in the College of Agricultural and Environmental Science has to be tough if all you animal science majors one day want to attend the world’s No. 1 vet school, yes, right here at UC Davis. Theory is a big part of the classes in our college, because UC Davis students are smart, and they need to know why. But they also learn how. Our animal science majors, for example, have plenty of opportunities to get hands-on experience outside the classroom. If you are interested, you can live in a barn. Well, in a bedroom, in a barn. We have residency internships that let students live and work in various animal facilities including the Horse Barn, the Sheep Barn, the Goat Barn, the Dairy, and one of the loudest of all — I know because I’ve visited a couple of times — the Swine Facility. Free rent and a showstopping answer at any social gathering to the question, “Where do you live?" Opportunities for practical learning don’t stop at the barn door. Our food science majors get their hands on hops, yeast and barley as they learn how to brew beer in a gleaming new pilot brewery. Viticulture and enology students practice their winemaking skills from crush to bottle in a state-of-the-art facility right next door. There are rich and varied opportunities for practical learning in our college — in laboratories, in the field, on the farm. Because as great as the college years are — and I hate to be the one to break this news to you — the goal is to graduate and move on to a fulfilling career. Fortunately, you don’t have to navigate that journey on your own. Our College of Agricultural and Environmental Science is broad, and the careers our graduates pursue are broader still. As a landscape architecture major, you could work as a landscape designer. As an animal science major, you might do research in animal nutrition. As a human development major, you could work in child care or pursue a teaching credential. As a plant sciences major, you might work as a greenhouse manager or assist with plant breeding. For some of you, your education won’t end with a bachelor’s degree. Approximately 16 percent of our graduates go directly to graduate or professional school. Many others work for a few years and eventually pursue additional studies. Law school, vet school, med school, business school, graduate studies in accounting, education, science, public policy, international development — our graduates know how to build on their undergrad years. In future posts, we’ll look more closely at specific majors, where they lead, and the paths our successful alumni have followed after graduation. The more you learn about the College of Agricultural and Environmental Sciences, the more you’ll want to join our community. Come visit us anytime — contact our Aggie Ambassadors to schedule a tour.